(Guyton) As food in the cells is gradually oxidized, the released energy is used to re-form the ATP so that the cell always maintains a supply of this essential molecule. Karp quotes an estimate that more than 2 x 1026 molecules or >160kg of ATP is formed in the human body daily! ATP is remarkable for its ability to enter into many coupled reactions, both those to food to extract energy and with the reactions in other physiological processes to provide energy to them. In animal systems, the ATP can be synthesized in the process of glycolysis in which there is a net production of two ATP molecules in a cycle. This glycolysis is a major step in anaerobic respiration. For aerobic respiration the glycolysis is also a source of ATP but the more productive process in the tiny energy factories called mitochondria plays a major role in the production of ATP. The structure of ATP has an ordered carbon compound as a backbone, but the part that is really critical is the phosphorous part – the triphosphate. Three phosphorous groups are connected by oxygens to each other, and there are also side oxygens connected to the phosphorous atoms. Under the normal conditions in the body, each of these oxygens has a negative charge, and therefore repel each other. These bunched up negative charges want to escape – to get away from each other, so there is a lot of potential energy here. If you remove just one of these phosphate groups from the end, so that there are just two phosphate groups, the molecule is much happier. This conversion from ATP to ADP is an extremely crucial reaction for the supplying of energy for life processes. Just the cutting of one bond with the accompanying rearrangement is sufficient to liberate about 7.3 kilocalories per mole = 30.6 kJ/mol. This is about the same as the energy in a single peanut. Living things can use ATP like a battery. The ATP can power needed reactions by losing one of its phosphorous groups to form ADP, but you can use food energy in the mitochondria to convert the ADP back to ATP so that the energy is again available to do needed work. In plants, sunlight energy can be used to convert the less active compound back to the highly energetic form. For animals, you use the energy from your high energy storage molecules to do what you need to do to keep yourself alive, and then you “recharge” them to put them back in the high energy state. 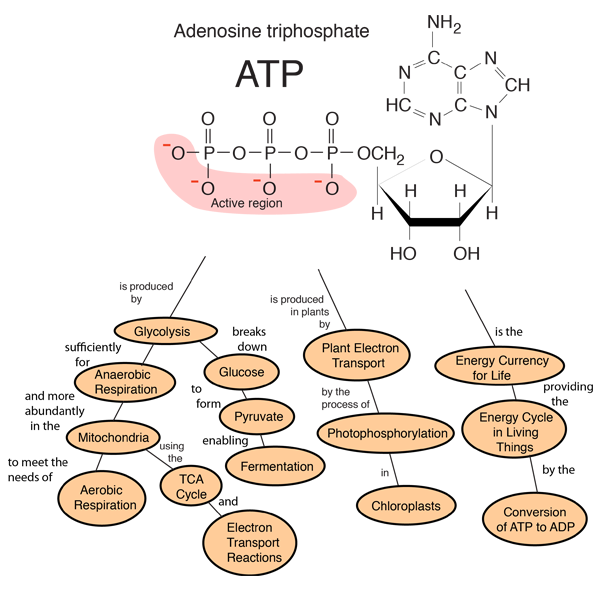 The oxidation of glucose operates in a cycle called the TCA cycle or Krebs cycle in eukaryotic cells to provide energy for the conversion of ADP to ATP.